Shah, S.T., et al. Effect of Homemade Dental Powder on Population of Streptococcus Mutans In vitro. (2016) J Dent Oral Care 2(4): 1- 7. © 2016 Shah, S.T. This is an Open access article distributed under the terms of Creative Commons Attribution 4.0 International License. Background: Dental caries is a very common disease, and this study was conductedto identify the optimum concentration of a homemade dental powder that could be used to prevent dental caries. The formulation for this dental powder was inspired from an ancient Indian powder which is still being used in remote areas where modern dentifrices are not available. The dental powder is homemade, with its four main constituents being alum, turmeric, cloves and salt all ground into a fine powder. Objective: The aim of the study was to study the effect of a homemade dental powder on a population of Streptococcus mutans. Study design: This was arandomized controlled laboratory study. Setting: The study was carried out in the histopathology laboratory, School of Dental Sciences, University of Nairobi. Materials and methods: Streptococcus mutans were cultured and the disc diffusion technique employed, where the discs had various concentrations of the dental powder, alum, turmeric, cloves and salt, which was made by titrating with distilled water so as to form a spectrum of concentrations. The diameters of the clear zones on the agar plates were then measured to assess the effect of the dental powder on the bacterial population. Results: At a concentration of 5 g/100 ml, the alum and salt showed clear zones of 5 mm which is equivalent to that of the negative control. The clear zone of the dental powder, turmeric and cloves was greater than that of distilled water, but less than that of the 2% chlorhexidine (14.6 mm). At 7.5 g/100 ml and 10 g/100 ml, salt still had a clear zone of 5 mm, and the rest of the ingredients had clear zones of greater than 5 mm, but less than 14.6 mm. At 12.5 g/100 ml, all ingredients had clear zones of greater than 5mm, and those of the dental powder and cloves were greater than 14.6 mm, while at 15 g/100 ml, in addition to cloves and powder, salt also had a clear zone of greater than 14.6 mm. Conclusion: The dental powder, alum, turmeric, cloves and salt all showed antimicrobial activity against Streptococcus mutans. The dental powder showed highest activity, followed by cloves, salt, alum and turmeric. Dental caries is a chronic disease of multifactorial aetiology and pathogens. The early stage of dental caries is characterized by destruction of enamel caused by acids. These acids are products of carbohydrate metabolism by Streptococcus mutans. Dental caries is a major public health concern. Teeth affected with dental caries are sources of infection, which can cause pulpitis, periodontitis and gingivitis. If left untreated, this disease eventually leads to teeth loss, which causes chewing difficulties and aesthetic problems. Dental powder is homemade and all natural, free of any harmful chemical constituents, its main constituents being alum, turmeric, cloves and salt all ground into a fine powder. This powder formulation is greatly inspired from the ancient Indian powder that is available in remote areas where modern dentifrices are not available. Alum is a major constituent of this homemade powder. It isantibacterial, acidic and astringent, hence providing a harsh environment, for disease causing bacteria to thrive in, and its sweet taste makes use of the dentifrice a more acceptable and pleasing experience. Turmeric is also a vital part of this dental powder formulation and is well known for its anti-microbialproperties. The most important chemical components of turmeric are a group of compounds called curcuminoids, which include curcumin (diferuloylmethane), demethoxycurcumin, and bisdemethoxycurcumin. Curcumin is believed to be anti-inflammatory, antioxidant, antitumour, antibacterial, and antiviral. Salt is another major constituent of the dental powder, it already has a place in modern dentifrices, and is widely used for promoting the dentifrices brand. It can act as an abrasive in toothpowder and also create a harsh environment not allowing the bacteria to thrive in this conditions. Another vital ingredient is cloves. Clove bud oil, has been used for a long time by dentists as a dressing in dentistry for minor wounds, as an analgesic in painful and infective diseases of the oral cavity and pharynx as well as general hygiene. General antiseptic in medical dental practicesA. Streptococcus mutans is mainly implicated in the progression of dental carries. The constituents of the tooth powder reduce the microbial population of the above named microorganism, and therefore reduce plaque formation and consequently prevent dental caries. A major constituent of this dental toothpowder is alum. A study conducted on the effect of an alum-containing mouth rinse in children for plaque and salivary levels of selected oral microflora showed that there was a marked reduction in the levels of Streptococcus mutans after two to four weeks of use of the mouth rinse. A research done on antibacterial activity of Propolis, Alum, Miswak, Green and Black Tea, Cloves extracts against Porphyromonas gingivalis Isolated from periodontitis patients in Hilla city, Iraq showed a maximum clear zone with alum and Miswak aqueous extracts, respectively. Another research on comparative evaluation of the effects of an alum-containing mouth rinse and a saturated saline rinse on the salivary levels of Streptococcus mutans showed that both saturated saline and alum rinses exhibited significant reductions in salivary counts of Streptococcus mutans when the baseline values were compared with the post treatment values after the 10th and 21st days. Salt is another major component of the dental powder. In a study on the antibacterial activity potential of commonly used food preservatives, the mutton broth solution which was streaked on the petri dish with salt solution showed resistance to bacterial strains till the 3rd day. Another constituent of the dental powder is turmeric. In a study ofantibacterial activity of curcuma longa varieties against different strains of bacteria, antibacterial activity was studied and the curcuminoid extracts suppressed the growth of several bacteria. Curcuminoid is the main active component of turmeric. A research on medicinal plants in the treatment of dental caries showed Xanthorrhizol, a methanol extract of tumeric plant roots, Curcumaxanthorrhiza, to have high levels of antibacterial activity against oral pathogens which in some cases equal or similar to that of chlorhexidin. In a study done on the antimicrobial activity of commercially available essential oils against Streptococcus mutans, Cinnamon oil, lemongrass oil, cedar wood oil, clove oil and eucalyptus oil all exhibited antibacterial property against Streptococcus mutans. Another studyon antimicrobial activities ofsome substances used in oral cavity spray revealed antimicrobial property of clove oil on oral bacteria, especially against Staphylococcus aureus and Candidaalbicans[15-19]. The aim of this study was to determine the effect of the homemade dental powder and its individual constituents on the population of Streptococcus mutans. The dental powder can be made and used by people especially in remote areas, thus reducing their oral bacterial load and hence risk of dental caries. This was a controlled laboratory study carried out in the histopathology laboratory, School of Dental Sciences, University of Nairobi Kenya. The study included Streptococcus mutans culture. The bacterial samples were obtained from the microbiology laboratory at Kenyatta National Hospital. Bacteria of the same species were incubated at 37°C for 48hrs. The sample size was calculated using Betty K Kirkwood Formula (1992). The minimum sample size calculated was 36. However, a sample size of 85 was used. A Data collection form was used to collect data (Data collection form)(Table 1). The dental powder was made using alum, salt, turmeric powder and powdered cloves. The alum was soaked in distilled water for fifteen hours, then dried in an oven for sixty minutes, after which it was ground into a fine powder using a mortar and pestle. Two hundred grams of alum powder was mixed with 50 grams of turmeric, 50 grams of salt and 10 grams of powdered cloves. The dental powder was then titrated into distilled water to form various concentrations (5 g/100 ml; 7.5 g/100 ml; 10 g/100 ml; 12.5 g/100 ml; 15 g/100 ml).This was repeated for the alum, the turmeric, the cloves and the salt, and the mixtures were autoclaved to ensure sterility. Discs with a diameter of 5 mm were made using blotting paper and were autoclaved to avoid contamination. 15 discs were soaked overnight in each of the above mixtures. 5 discs were soaked overnight in distilled water to make the negative control, and another 5 in 2% chlorhexidine which was the positive control. The following day, they were dried on the bench for 30 minutes. Streptococcus mutans isolates were diluted in peptone broth according to McFarland turbidity standard of 0.5 and then seeded onto the petri dishes containing blood agar using sterile swabs. Five discs, one of each concentration of the dental powder were placed in the petridish, and triplicates were made. The procedure was repeated for alum, turmeric, salt and cloves. Five discs of distilled water were placed in one petridish, and 5 discs of 2% chlorhexidine were placed in another petridish. The petri dishes were then incubated at 37°C for 48 hours. Disc diffusion method was used and the diameter of clear zones was measured to check the susceptibility of the bacteria to the dental powder and its ingredients. Calibration of the weighing scale was done. Three measurements were taken for each concentration of the ingredients in order to minimize chances of error. There was use of a positive and a negative control. For control of biases and errors, all the petri dishes were incubated under the same conditions of 37°C for 24 hrs. The bacterial samples were obtained from the same bottle, hence were of the same species and strain and a repetition were done and average calculated to minimise errors. The diameter of the clear zones around the discs was measured using a ruler, and the average diameter calculated. The mean and standard deviation of the diameter of clear zone were calculated. Statistical significance was measured by one way Anova followed by Tukey’s post-hoc test. Analysis of data was done by SPSS (statistical package for social sciences) version 16.0. A total of 85 samples were studied. Of these, 15 were for the dental powder, 15 for alum, 15 for turmeric, 15 for cloves and 15 for salt. 5 were for distilled water, which was the negative control, and the remaining 5 for 2% chlorhexidine which was the positive control. Of the 15 used for each ingredient and the dental powder above, 3 each were for 5 g/100 ml, 7.5 g/100 ml, 10 g/100 ml, 12.5 g/100 ml, and 15 g/100 ml concentrations, such that triplicates were made. Distilled water was used as a negative control, and 2% chlorhexidine was used as a positive control. The average clear zone with distilled water and chlorhexidine was 5 mm and 14.6 mm, respectively (Figure 1). Figure 1: Diameter of clear zones with distilled water and 2% chlorhexidine. The dental powder had an average clear zone of 7.67 mm, 9.33 mm, 13.33 mm, 15.67 mm, and 20.67 mm at concentrations of 5 g/100 ml, 7.5 g/100 ml, 10 g/100 ml, 12.5 g/100 ml and 15 g/100 ml, respectively. As the concentration of the dental powder increased, the diameter of the clear zone also increased (Figure 2). 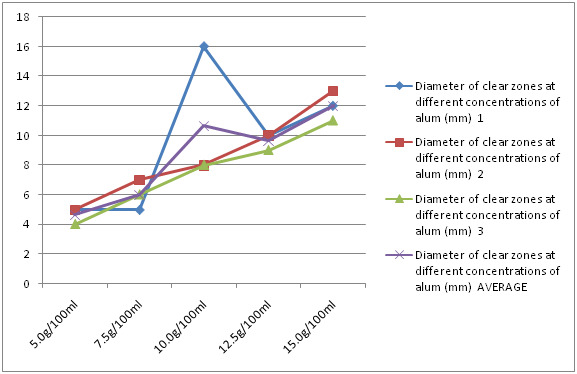 Figure 2: Diameter of clear zones at different concentrations of dental powder. Alum had an average clear zone of 5 mm, 6 mm, 10.67 mm, 9.67 mm, and 12 mm at concentrations of 5 g/100 ml, 7.5 g/100 ml, 10 g/100 ml, 12.5 g/100 ml and 15 g/100 ml, respectively. Generally, as the concentration of alum increased, the diameter of the clear zone also increased (Figure 3). Figure 3: Diameter of clear zones at different concentrations of alum. Turmeric had an average clear zone of 9 mm, 10.33 mm, 11 mm, 11 mm and 10.67 mm at concentrations of 5 g/100 ml, 7.5 g/100 ml, 10 g/100 ml, 12.5 g/100 ml and 15 g/100 ml, respectively. Increasing the concentration of the turmeric had no significant change in the diameter of the clear zones. The clear zones were of about the same size at every concentration (Figure 4). 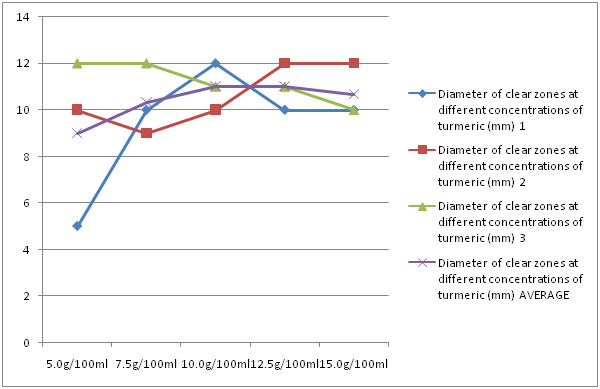 Figure 4: Diameter of clear zones at different concentrations of turmeric. Cloves had an average clear zone of 6.33 mm, 7.67 mm, 10.67 mm, 15 mm and 15.33 mm at concentrations of 5 g/100 ml, 7.5 g/100 ml, 10 g/100 ml, 12.5 g/100 ml and 15 g/100 ml, respectively. 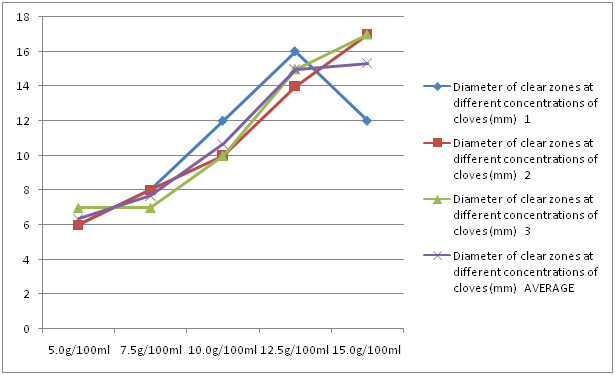 As an overall trend, as the concentration of cloves increased, the diameter of the clear zone also increased (Figure 5). 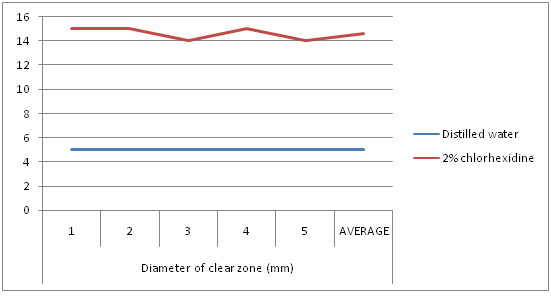 Figure 5: Diameter of clear zones at different concentrations of cloves. Salt had a mean clear zone of 5 mm, 5 mm, 5 mm, 14 mm and 16.67 mm at concentrations of 5 g/100 ml, 7.5 g/100 ml, 10 g/100 ml, 12.5 g/100 ml and 15 g/100 ml, respectively. 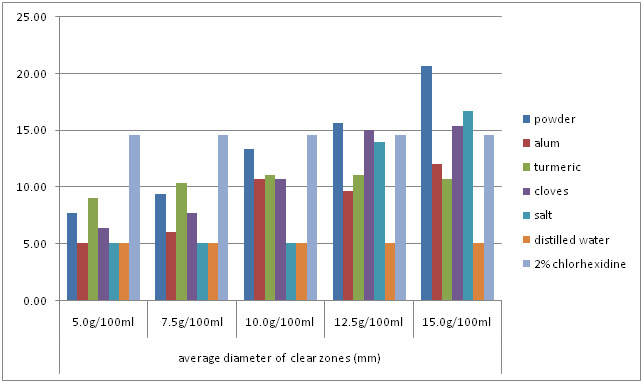 Up to 10 g/100 ml, there was a plateau in the clear zones, but for concentrations above those, as concentration increased, the diameter of the clear zone also increased (Figure 6). Figure 6: Diameter of clear zones at different concentrations of salt. The bar chart below (Figure 7) summarizes the results discussed in figures 1 to 6. Figure 7: Comparison of average clear zones of the powder, individual ingredients and the controls. At a concentration of 5 g/100 ml, there was a significant difference between the means of the clear zones of the ingredients (F = 13.176). The most potent ingredient was 2% chlorhexidine, followed by turmeric, dental powder and cloves, in descending order. Distilled water, salt and alum had equal potency (Table 2). Table 2: Antimicrobial activity of the dental powder and ingredients at 5 g/100 ml. At a concentration of 7.5 g/100 ml, there was a significant difference between the means of the clear zones of the ingredients (F = 63.314). The most potent ingredient was 2% chlorhexidine, followed by turmeric, dental powder, cloves, and alum in descending order. Distilled water and salt had equal potency(Table 3). 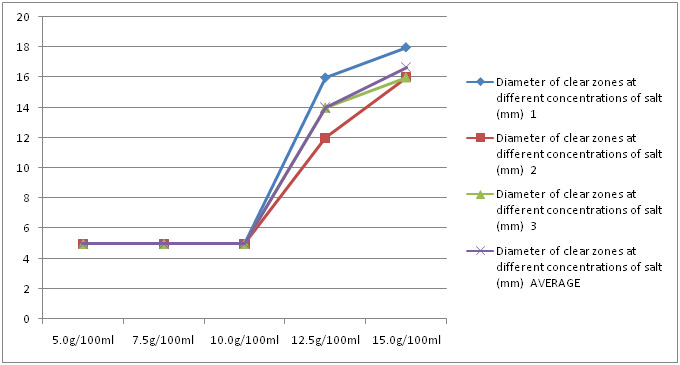 Table 3: Antimicrobial activity of the dental powder and ingredients at 7.5 g/100 ml. At a concentration of 10 g/100 ml, there was a significant difference between the means of the clear zones of the ingredients (F = 12.272). The most potent ingredient was 2% chlorhexidine, followed by dental powder, turmeric, cloves, and alum in descending order. Distilled water and salt had equal potency (Table 4). 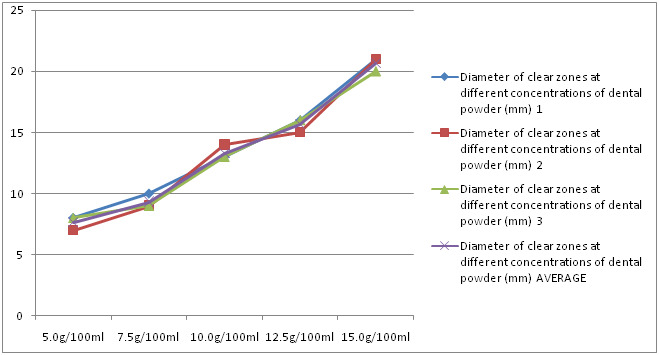 Table 4: Antimicrobial activity of the dental powder and ingredients at 10 g/100 ml. At a concentration of 12.5 g/100 ml, there was a significant difference between the means of the clear zones of the ingredients (F = 46.475). The dental powder and cloves were more potent than 2% chlorhexidine. Salt was less potent than chlorhexidine. The potency then reduced in turmeric, alum and distilled water, in that order (Table 5). Table 5: Antimicrobial activity of the dental powder and ingredients at 12.5 g/100 ml. At a concentration of 15 g/100 ml, there was a significant difference between the means of the clear zones of the ingredients (F = 42.131). The dental powder, salt and cloves were more potent than 2% chlorhexidine. Alum was less potent than chlorhexidine, with turmeric being even less potent followed by distilled water (Table 6). Table 6: Antimicrobial activity of the dental powder and ingredients at 15 g/100 ml. The disc diffusion method is most commonly used to determine antimicrobial susceptibility. This study used aqueous extracts of dental powder, alum, turmeric, cloves and salt. In this study, various concentrations of these were tested for their inhibitory effects against Streptococcus mutans. A negative control (distilled water) and a positive control (2% chlorhexidine) were used, and the average clear zones were 5mm and 14.6 mm, respectively. That means that the clear zone should be greater than 5 mm if an ingredient showed any antimicrobial activity. The dental powder had an average clear zone of 7.67 mm, 9.33 mm, 13.33 mm, 15.67 mm, and 20.67 mm at concentrations of 5 g/100 ml, 7.5 g/100 ml, 10 g/100 ml, 12.5 g/100 ml and 15 g/100 ml, respectively. The dental powder showed antimicrobial activity at all concentrations, and it was greater than that of 2% chlorhexidine at concentrations of 12.5 g/100 ml and 15 g/100 ml. It also had a larger diameter of clear zones compared to the individual ingredients at all concentrations except 5 g/100 ml and 7.5 g/100 ml where turmeric showed greater antimicrobial activity. This was due to the synergistic effects of all the ingredients used in the formulation against the Streptococcus mutans. Alum had an average clear zone of 5 mm, 6 mm, 10.67 mm, 9.67 mm, and 12 mm at concentrations of 5 g/100 ml, 7.5 g/100 ml, 10 g/100 ml, 12.5 g/100 ml and 15 g/100 ml, respectively. Alum did not show antimicrobial activity at concentration of 5 g/100 ml, showed slight antimicrobial activity at 7.5 g/100 ml and it increased as the concentration of the alum increased. However, it was less effective than 2% chlorhexidine at 15 g/100 ml. Making a stronger concentration of the alum may produce antimicrobial effects comparable to the chlorhexidine. Also the minimum inhibitory concentration (MIC) of alum was in-between 5 and 7.5 g/100 ml. Turmeric had an average clear zone of 9 mm, 10.33 mm, 11mm, 11mm and 10.67mm at concentrations of 5 g/100 ml, 7.5 g/100 ml, 10 g/100 ml, 12.5 g/100 ml and 15 g/100 ml, respectively. Turmeric showed antimicrobial activity of a similar level against at all concentrations since the solutions were saturated, hence they all diffused into the agar with a similar rate and quantity. The antimicrobial effect, however, was less than that of 2% chlorhexidine. Increasing the concentration of the turmeric will not increase the antimicrobial effect since the solutions were already saturated. Therefore, this is the maximum antimicrobial effect of turmeric. Cloves had an average clear zone of 6.33 mm, 7.67 mm, 10.67 mm, 15 mm and 15.33 mm at concentrations of 5 g/100 ml, 7.5 g/100 ml, 10 g/100 ml, 12.5 g/100 ml and 15 g/100 ml, respectively. As the concentration increased, the effect of the cloves on the bacteria also increased. At concentrations of 12.5 g/100 ml and 15 g/100 ml, it was comparable to that of 2% chlorhexidine. Increasing the concentration further may have an increased effect on the bacteria provided the solutions are not saturated. Salt had a clear zone of 5 mm, 5 mm, 5 mm, 14 mm and 16.67 mm at concentrations of 5 g/100 ml, 7.5 g/100 ml, 10 g/100 ml, 12.5 g/100 ml and 15 g/100 ml, respectively. At concentrations of 10 g/100 ml and below, the Streptococcus mutans was resistant to the salt. This was because the minimum inhibitory concentration of salt is greater than 10 g/100 ml. On the other hand, at 12.5 g/100 ml and 15 g/100 ml, salt had similar antimicrobial activity to 2% chlorhexidine since these concentrations exceeded the minimum inhibitory concentration of the salt against Streptococcus mutans. The dental powder, alum, turmeric, cloves and salt all showed antimicrobial activity against Streptococcus mutans. The dental powder and cloves showed antimicrobial activity, and at 12.5 g/100 ml and 15 g/100 ml they had greater inhibitory effect than 2% chlorhexidine. Salt had antimicrobial activity at concentrations greater than 12.5 g/100 ml, and at 15 g/100 ml it was greater than 2% chlorhexidine. Alum showed antimicrobial activity against streptococcus mutans; however, it was not as effective when compared to 2% chlorhexidine. Dental powder had the greatest activity, followed by cloves, salt, alum and turmeric. The dental powder can be used as a dentifriceat concentrations of 12.5 g/100 ml of water or higher for the prevention of dental caries. A 12.5 g of salt can be added to 100 ml of water and used as a mouth rinse for prevention of dental caries. A 12.5 g of powdered cloves can be added to 100 ml of water and used as a mouth rinse for prevention of dental caries. Turmeric and alum can be used as an adjunct to tooth brushing for prevention of dental caries. Authors are grateful to the following for their kind support during the study: Miss Mary (Microbiologist, Medanta), Mr. Oloo (Microbiologist, Kenyatta National Hospital), Mr. Errols (Histopathology, School of Dental Sciences), Mr. Desmond Kowino for the assistance during data analysis. Last but not least Mr. Trupit K Shah, Mrs. Jayshree T Shah and Miss Sonam T Shah for their utmost financial support. The authors had full freedom of investigation and there were no potential conflicts of interest. 1. Loesche, W.J. Role of Streptococcus mutans in human dental decay. (1986) Microbiological Reviews 50(4): 353-380. 2. Allen, P. F. Assessment of oral health related quality of life. (2003) Health and Quality of Life Outcomes1: 40. 3. Aguilar, T. N.,Blaug, S.M.,Zopf, L.C.A study of the antibacterial activity of some complex aluminium salts. (1956)J Am Pharm Assoc Am Pharm Assoc45(7): 498–500. 4. Chaturvedi, T.P. "Uses of turmeric in dentistry: an update". (2009) Indian J Dent Res 20(1): 107–109. 5. Aggarwal, B.B., Sundaram, C., Malani, N., et al. "Curcumin: The Indian solid gold". (2007)AdvExp Med Biol 595(1): 1–75. 6. Anoop Kumar, S., Balaji, R.R., Deepika, S., et al. Studies on the antibacterial activitypotential of commonly used food preservatives. (2010) International Journal of Engineering Science and Technology 2(3): 264-269. 7. Cai, L., Wu, C.D. Compounds from Syzygiumaromaticum possessing growth inhibitory activity against oral pathogens. (1996) J Nat Prod 59(10): 987-990. 8. Wefel, J.S., Clarkson, B.H., Heilman, J.R. Natural root caries: A histologic and microradiographic evaluation. (1985) J Oral Pathol14(8): 615-623. 9. Olmez, A., Can, H., Ayhan, H., et al. Effect of an alum-containing mouthrinse in children for plaque and salivary levels of selected oral microflora. (1998) J ClinPediatr Dent 22(4): 335-340. 10. Muhammad, H.H. Invitro antibacterial activity of propolis, alum, miswak, green and black tea, cloves extracts against porphyromonasgingivalis isolated from periodontitis patients in Hilla City, Iraq. (2013) American Journal of phytomedicine1(2): 140-148. 11. Rupesh, S.,Winnier, J.J.,Nayak, U.A.,et al. Comparative evaluation of the effects of an alum-containing mouthrinse and a saturated saline rinse on the salivary levels of Streptococcus mutans. (2010) Journal of Indian society of periodontics and preventive dentistry28(3):138-144. 12. Shagufta, N., Safia, J., Saiqa, I., et al. Antibacterial activity of curcuma longa varieties against different strains of bacteria. (2010)Pak J Bot 42(1): 455-462. 13. Pooja, K., Kapil, L., Shri Krishna, K., et al. Medicinal Plants in the Treatment of Dental Caries. (2012) Asian Journal of Oral Health & Allied Sciences 2(1): 12-16. 14. Chaudhari, L.K., Jawale, B.A., Sharma, S., et al. Antimicrobial activity of commercially available essential oils against Streptococcus mutans 13(1): 71-4. 15. Thawatchai, P., Juree, C., Wanpen, S., et al. Antimicrobial Activities of Some Substances Used in Oral Cavity Spray. (2012) Research Journal of Pharmaceutical, Biological and Chemical Sciences3(4): 1295-1300. 16. Slots, J., Genco, R.J. Microbial pathology. Black pigmented Bacteroides species, Capno-cytophagaspp and Actinobacillusactinomycetemcomitans in human periodontal diseases: Virulence factors in colonization survival and tissue destruction. (1984) J Dent Res 63(3):412-421. 17. Amano, A., Tamagawa, H., Shizukuishi, S., et al. Superoxide dismutase, catalase and peroxidases in oral anaerobic bacteria. J Osaka Univ Dent Sch(1986) 26:187–192. 18. Baker, P.J., Evans, R.T., Slots, J., et al. Antibiotic susceptibility of anaerobic bacteria from the human oral cavity. (1985) J Dent Res 64(10):1233-1244. 19. Baker, P.J., Slots, J., Genco, R.J., et al. Minimal inhibitory concentrations of various antimicrobial agents for human oral anaerobic bacteria. (1983) Antimicrob Agents Chemother24(3):420–424. 20. Kirkwood, R.B., Sterne, A.C.J. Essentials of medical statistics 2ndedn. (2003) Blackwell Science 240.